Tribes and State Formation is the first effort to bring together the disciplines of history, anthropology, and political science around a major topic that none of these alone is adequately equipped to address. How and why did certain tribal societies metamorphose over time into states? Scholars concerned with general questions of theory and methodology and the interaction of anthropology and history, as well as political scientists and sociologists concerned with concepts of the state in the Middle East and other developing regions, will be well served by this innovative work. 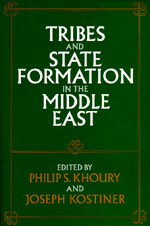 The articles by an array of distinguished scholars cover a wide range of topics: the relationship of ideology to tribal and state power, comparisons between different regional patterns of tribe-state interaction, historical case studies from North Africa, the Arabian Peninsula, and Iran extending to the contemporary period; theoretical and methodological inquiries, and systematic reviews of the literature on tribes and states. The articles argue against a unilinear approach to the study of tribes and state formation by emphasizing that states often existed alongside tribes and even created tribes for their own purposes. Some case studies emphasize the incompatibility of states and tribalism, while others illustrate the many areas in which tribes actually enhanced rather than impeded state formation. Philip S. Khoury is Professor of History and Acting Dean of the School of Humanities and Social Sciences at the Massachusetts Institute of Technology. Joseph Kostiner is Lecturer in Middle Eastern History at Tel Aviv University and the author of South Yemen's Revolutionary Strategy, 1970-1985 (Tel Aviv, 1990).